Preserved lemons are a staple in Moroccan cuisine and are added to slow cooking tagines, stews, and soups for a wonderful tangy lemon flavor that can not be duplicated with fresh lemons. 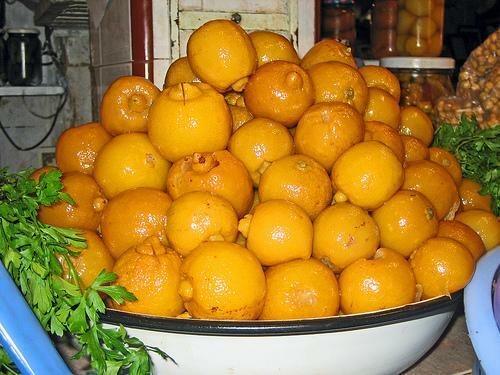 In Morocco, these lemons can be bought individually at a souk, or marketplace, and are very easy to find given their importance in Moroccan dishes. Outside of Morocco these lemons may be found in Middle Eastern or international markets but are so easy to make many cooks decide to prepare their own preserved lemons at home. The ingredients for Moroccan preserved lemons are extremely simple, all you need are whole fresh lemons, sea salt, lemon juice, and, in some recipes, vegetable oil. There is also the option of adding additional spices to make the preserved lemons more suitable for sweet or savory dishes. Cinnamon sticks are a common spice that is added for lemons that are going to be used in sweet dishes and pepper or bay leaves are added for lemons that are going to be used in savory tagine dishes. The pickling process takes about one month and the preserved lemons will be good to use for up to six months. A simple clean jar is sufficient to pickle the lemons in but it is suggested that if you are not planning on refrigerating the lemons that you use a proper sterilized canning jar. – Cut off both rounded ends of the lemon and make two deep cuts lengthwise downwards, careful not to cut all the way through, so that the lemon has been incised with an X. – Stuff the salt down into the cuts using about 1 tablespoon per lemon. If available use Moroccan sea salt for a finer taste. – Pack the lemons tightly into the jar, pushing them to the bottom, and cover with lemon juice and any additional spices you choose to include. Some recipes call for topping the jar with vegetable oil. -Leave the jar closed for one month, checking every couple of days to make sure the Moroccan lemons are fully submerged in juice. 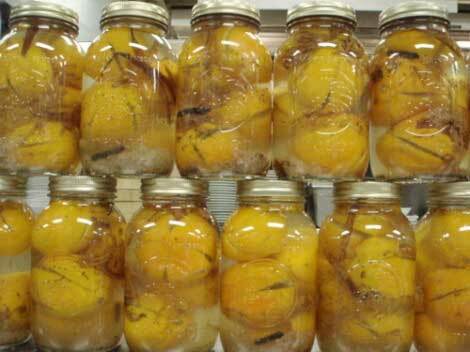 – After one month the Moroccan preserved lemons are ready, the pulp and skins will have become soft and silken and can both be used in cooking recipes. Some people use the juice as well but this is often too salty. Rinse the lemons in water before using to wash away the extra salt and then add to any slow-cooking meat or vegetable tagine dish. 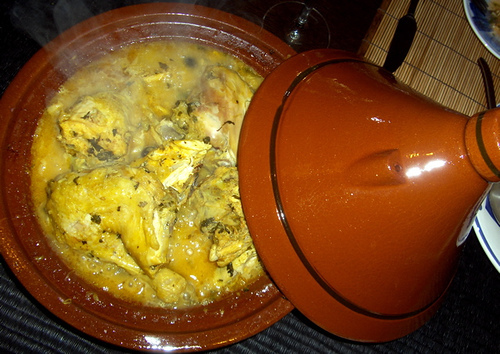 You are currently browsing the archives for the Chicken and Preserved Lemon Tajine category.